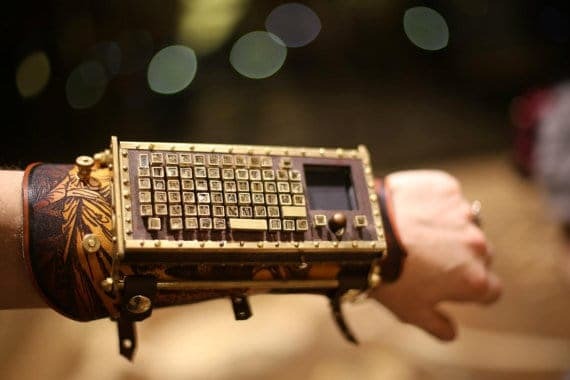 A remarkable handmade arm guard with a wireless wrist keyboard which is also functional. 3-in-1 multimedia wireless keyboard (Keyboard, TouchPad, Laser Pointer). Control your media while sitting on the sofa or lounging in bed, up to 100 feet away. Comes with a rechargeable lithium-ion battery for faster charging. Support Windows, OS X and Linux. Twenty-four clocks come together to tell a collective story in one singular digital display. Each individual clock hand is choreographed in line with the others, so that these clocks tell the time as a collective, rather than individually. One of its kind, a perfect decor thing for a person who has everything. Start your morning with soothing sounds of boiling water along with the enriching smell of the freshly brewed coffee or loose leaf tea. 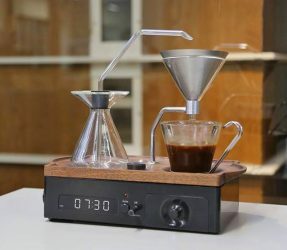 For coffee lovers, it will be a “dream come true” kind of technology. A coffee maker which looks perfect everywhere kitchen, living room or your bedroom. With the USB Mini Fridge, you can keep a cool beverage ready to drink at all times! The personal USB Fridge holds a single 12 ounce can which is illuminated from the blue LED inside the fridge. Easy installation, no driver required, plug & play. Can be used in your home office, bedroom or garage! Simply plug the USB port in, insert your canned drink and enjoy! World’s first anti-gravity water droplet air purifier. It utilizes the principles of basic science it creates an anti-gravity effect that sends water upwards which attracts onlooker. This extraordinary visual effect happens when combines the power of negative ion technology for filtration. Another innovative computer keyboard for setting up a workstation on the go. It connects with all devices via Bluetooth and has a touchpad on its right side corner. Multi-touchpad and ScrollBar – allows for scrolling, screen flip, mouse click and Smartphone. Portable with a rechargeable battery. Also, have a backlight for convenient typing in low light. How cool is that a computer keyboard which can be washed or submerged? Accidental coffee spill or food won’t be a problem with this washable keyboard. This waterproof and washable keyboard with ultra-durability can let you do typing in the bathtub. Standard size keyboard with a clean contemporary design. A uniquely modern design computer keyboard with an amazingly comfortable feel. The split keyboard layout to help position the wrists and forearms in a natural, relaxed position. Also featured a cushioned palm rest to provide wrist support, and a domed keyboard shape to reduce wrist pronation. The separate number pad provides more flexibility for your workspace setup. A triple foldable keyboard with full standard size keyboard for a user-friendly experience. With this setup your workstation anywhere you go. Its tri-folding design makes it easy to carry anywhere you go. Compatible with all iOS, Windows and Android devices. Both wireless and wired connectivity available. Full charging lasts up to 10 days. Compact, lightweight, and very convenient to use with any smartphone. This wireless foldable Bluetooth keyboard connects with all type of mobile devices using Bluetooth. And comes with a foldable feature to fit in your pocket to carry it anywhere you want. Ergonomic design based on different typing habits. Time to upgrade your workspace with this cool future tech. No need to use your fingers or wrist motion to operate. Its innovative design offers all the functions of 128 keys on keyboard and mouse functionality in its two dome-shaped controllers. A perfect keyless keyboard for individuals with hand, finger injury, carpal tunnel syndrome, cerebral palsy, multiple sclerosis, traumatic brain injury, spinal cord injury, arthritis, and autism. Planning for a trek or a mountaineering or any off the grid location? No need to worry anymore. Gotenna Phone Network is a 100% off-grid, a long-range consumer-ready mesh network is here. It pairs with your smartphone and provides communication at any place, no matter where you are and the best part is that you don’t need any towers or routers or satellites. A customizable control panel with 80 keys compact design. A singlehanded programmable keyboard and controls which provide you reliable computer input hardware experience. Perfect for providing mission-critical controls with unparalleled support. Clear key lenses to customize keyboard buttons with pre-printed icons as per your need. Add or remove keys, blockers, and large keys to create an intuitive layout for your workflow. Support both Windows and OS X. A small and portable virtual keyboard for any workspace. A high tech functional virtual keyboard which works on a built-in infrared laser projector. Nearly a size of your smartphone this virtual laser keyboard projects a standard size keyboard on the working surface. Makes it perfect to carry around anywhere you go. Adjustable brightness and volume. Replace your old computer keyboard and mouse with TAP a wireless wearable keyboard, mouse and game controller. It let your fingers control and communicate with the digital world. Just by tapping your fingers and moving your thumb, you can write characters and give commends to any Bluetooth device. Why carry those boring power banks when you can carry this eye-catching watermelon power bank to keep your devices all charged up. This funky gadget will definitely add to your fashion and personality this summer. Enjoy extra hours of snap chat and music on beaches this season with this super cool melon magic portable power bank. Experience safer cycling with this Intelligent bike helmet a perfect dose of security with style. It can detect approaching cars in your blind spot, its intuitive turn signals can read your gestures signals. Brake lights turn on automatically when you reduce speed or power break. And can also access and share videos. 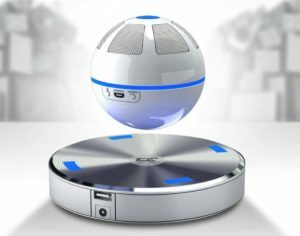 This levitating Bluetooth speaker is no joke. It is way more than just a style statement. It’s cone designed to increase 3D surround effect. Now you can defy the law of gravity with this floating Bluetooth speaker and be like a time traveler in front of your pals.